Chapter Three: What is Thanksgiving Prayer? Christian thanksgiving prayer to God. Gratitude isn’t an optional add-on for the Christian life. It’s at the core of everything that we are and everything we do. As a believer, my entire life should be a lengthy expression of thanksgiving for God and his provision. This is why we find exhortations to “give thanks” peppered throughout both the Old and New Testaments. And one of the primary ways that thanksgiving should take place in our lives is through prayer. But before we look at thanksgiving prayer, let’s take a moment to reflect on just what it means to be thankful and why it’s such an important part of being a Christian. As human beings, when we’ve been given a gift, it’s only natural to respond with appreciation. This is true whether the giver is a child, another adult, or – especially – God. With this in mind, it should make sense that the more we’ve been given, the more thankful we should be. Jesus taught his disciples this exact idea one day while having dinner at a Pharisees’s home. One of the men responded, “The one, I suppose, for whom he cancelled the larger debt.” Jesus commended him for his answer and then made a statement worth really meditating on: “Therefore I tell you, her sins, which are many, are forgiven—for she loved much. But he who is forgiven little, loves little” (See Luke 7:36-50 for the whole story). Jesus recognized that we “love much” and, as a result, are more thankful, when we recognize just how much we’ve received. As we see the many blessings, provisions, and protections that God has generously bestowed on us, we’re compelled to offer appreciation to him. And we do so through a variety of means. Scripture describes individuals giving thanks through song, dance, worship, and prayer. And the book of Leviticus includes provisions for making thanksgiving sacrifices. Any time we respond in faith to God’s grace, we give thanks – whether that response is through any of the above means or something else entirely. Thanksgiving prayer is simply our response to God’s good gifts. Thanksgiving and praise are the foundation of the spiritual life. Psalm 100 famously ends with these words: “Enter His gates with thanksgiving and His courts with praise. Give thanks to Him, bless His name. For the LORD is good; His lovingkindness is everlasting and His faithfulness to all generations” (Psalm 100:4-5 NASB). The Psalmist is trying to teach us something very important with these words. Any time we approach God, we ought to do so with praise and thanksgiving on our lips. This isn’t just because God wants our thanks – as if God only gives begrudgingly, after we’ve flattered him enough. Giving thanks at the beginning of our prayers is necessary because it helps us get in the right frame of mind. When I begin my prayer by recognizing not only who God is, but also everything he gave me, it will encourage me to pray more boldly. When I reflect on God’s provision in the past, I’ll be encouraged to rely on his provision for the future. We see this pattern of beginning with thanks in nearly all of Paul’s New Testament letters. After he opens his letter by acknowledging who he is writing to and letting them know that he is the author, he usually begins with something like this: “First, I thank my God through Jesus Christ for all of you, because your faith is proclaimed in all the world” (Romans 1:8). Or this: “We give thanks to God always for all of you, constantly mentioning you in our prayers” (1 Thessalonians 1:2). Or like this: “We always thank God, the Father of our Lord Jesus Christ, when we pray for you” (Colossians 1:3). Before saying a word about what the believers in these congregations were doing right or doing wrong…before writing about God’s expectations or coming judgment…Paul simply offered up a prayer of thanksgiving for all that God had already done in their lives. This put Paul in the right frame of mind to address all of the issues that he would have to address. By first, being thankful, Paul was less likely to come down harshly on them for their faults and failings. Thanksgiving was Paul’s first reaction. And it should be ours as well. We’ve already seen that scripture encourages us to be thankful for everything we’ve received from God’s hand. However, there are also a number of specific things that the Bible tells us we should offer appreciation for. Deliverance from enemies, both physical and spiritual, is one of the biggest themes in the entire Bible. So it only makes sense that we would be encouraged to give God thanks every time we experience the kind of deliverance that only he can provide. For example, in Psalm 44 we read, “But You have saved us from our adversaries, and You have put to shame those who hate us. In God we have boasted all day long, and we will give thanks to Your name forever” (Psalm 44:7-8). Here, the Psalmist give thanks for God’s salvation. Many other examples of this kind of thanksgiving we can see in Psalms as well as in other parts of scripture. Check out Exodus 15, 1 Corinthians 15:53-57, and Psalm 105 to see other examples of this kind of thanksgiving prayer. Thank the Lord for all His benefits towards you. Thank God for His protection, provision, and strength. Thank God for the precious gift of Salvation. Thank God for making you victorious over sin. Thank God for the privilege to be at His service. Scripture also encourages us to give thanks when our prayers are answered. We have a tendency to ask for things from God and then, once we’ve received them, to simply go on our way without taking the time to give God thanks for his blessing. But any time we receive from God, we should offer thanks – both to praise God for his faithfulness and to remind ourselves that we need him every moment of every day. There’s a beautiful example of this kind of prayer in 1 Samuel 2. A young wife, Hannah, had been praying for a son. After years of longing, God finally gave her the child she’d been waiting for. And her immediate response was a prayer of thanksgiving. Listen to how she begins this prayer: “My heart exults in the LORD; My horn is exalted in the LORD, my mouth speaks boldly against my enemies, because I rejoice in Your salvation” (1 Samuel 2:1). Like Hannah, we should offer thanksgiving prayers any time we receive an answer to prayer. We shouldn’t only give thanks when God provides an answer to prayer though. We should give thanks every time God provides, period. This is one of the reasons that many Christians pray before every meal. When we sit down to eat, we should remember that God is the source of every provision. And even if we’ve worked, earned our money, and purchased our own food, we’re still in debt to God. Without God’s provision, we wouldn’t have the ability to work or our health or life itself. As James wrote in his letter, “Every good gift and every perfect gift is from above, coming down from the Father of lights” (James 1:17). And since everything we have comes from God, we should offer him thanksgiving prayer for every provision. With that said, there’s one provision that God has made which far exceeds all others: the gift of his Son, Jesus Christ. Listen to how Paul describes the way we should receive this gift: “Therefore as you have received Christ Jesus the Lord, so walk in Him, having been firmly rooted and now being built up in Him and established in your faith, just as you were instructed, and overflowing with gratitude” (Colossians 2:6-7). Here, Paul tells us that as we live the life of faith in Christ, gratitude should ooze from our being. If we ought to give thanks for God’s many minor provisions, how much more should we offer thanks for the greatest gift of all? Christian thanksgiving prayer to God. Now, you may be thinking, “If I’m supposed to give thanks for all of these things, I’ll never be able to not give thanks.” And you are exactly right. Paul encourages us in several places to make giving thanks a way of life. In his letter to the Thessalonian Christians, he writes, “Rejoice always; pray without ceasing; in everything give thanks; for this is God’s will for you in Christ Jesus” (1 Thessalonians 5:16-18). 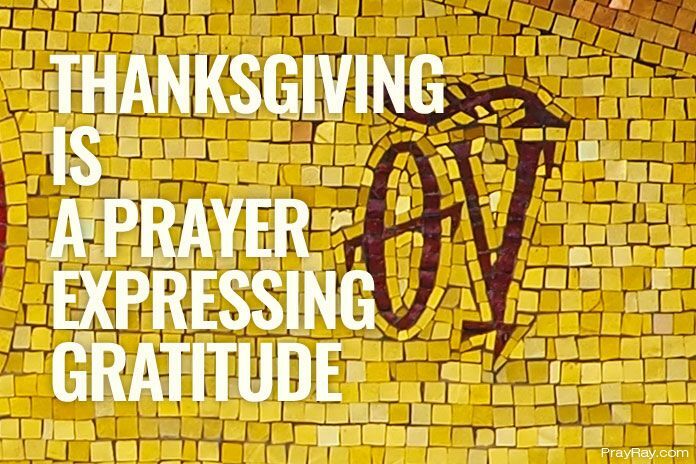 Fill our prayers with thanksgiving for everything. In fact, both Peter and James tell us that we should even rejoice and be thankful when we encounter trials and problems (see 1 Peter 1:3-9 and James 1:2). Why? Because even through the trials that we face, God is at work providing what we need to persevere. As our prayer lives become grounded in praise and thanksgiving, we will be empowered to pray more boldly and confidently to the God who has already given so much. We should remember again and again of who God is: our faithful creator, sustainer, and provider. Elwell, W. A., & Beitzel, B. J. (1988). Gratitude. In Baker encyclopedia of the Bible (Vol. 1, p. 900). Grand Rapids, MI: Baker Book House.